Grey ranks among the world’s top advertising and marketing organizations, serving one-fifth of the FORTUNE 500, in 96 countries. 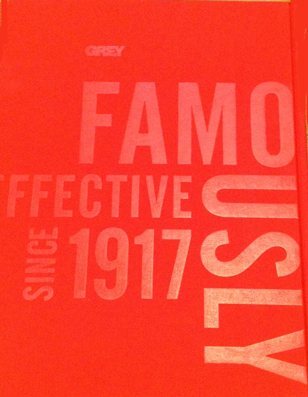 When famously effective Grey was a year away from its 100th business anniversary, the idea of a centennial book arose. It would be created in-house. A small team of staff members and existing freelancers reached out to CorporateHistory.net for guidance. Grey has created award-winning creative since decades before “Mad Men,” but the global agency had never done a corporate history. Where to start? How to handle the research, writing, and production? Which steps would keep the project on track to meet an unyielding deadline? CorporateHistory.net helped the Grey team leaders launch the project. We remained on-call as questions arose. The book was delivered on time, and on the night of the centennial party in Madison Square Park in Manhattan we raised a glass to Grey’s next 100 years. Under the banner of “Grey Famously Effective Since 1917,” this global organization continues to break new ground in brand experience across every platform and create lasting consumer connections.